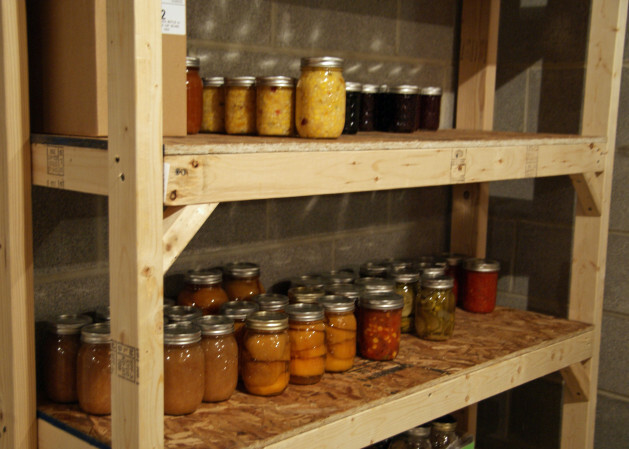 I’ve been wanting to make a set of shelves in the basement for everything I canned over the summer, and other bulk food storage. Now that the weather is sufficiently non-conducive to outside work, I was able to get around to it. The design is roughly based on these plans. I started with a bunch of 2 x 3’s (nine, to be exact, standard 8′ length), a couple 2 x 4’s (for the rear supports), and a couple 2 x 2’s. Two of the 2 x 3’s will become the supports, five are cut in half (4′ sections for the arithmetically challenged), and the rest will need to be cut into 13″ sections (10 total). The 2 x 2’s are cut into 13″ pieces; you’ll need 5 pieces total. These will be the center supports. 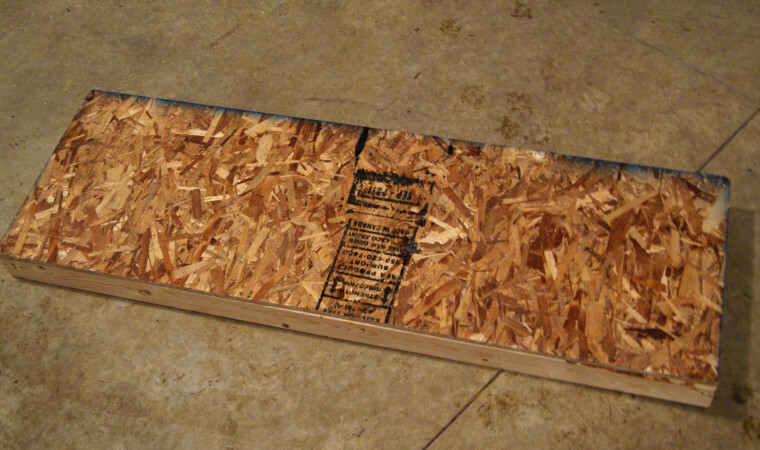 I also had one 4′ x 8′ sheet of 1/2″ OSB, cut into six 4′ x 16″ sections. 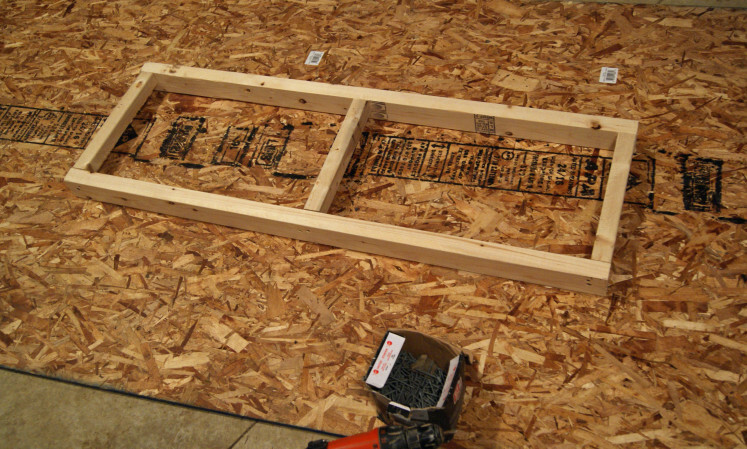 Start by making a frame consisting of the 2 x 3 pieces (see pic below) using two or three screws at each joint. In addition to the sides, I put a piece of 2 x 2 in the middle to help prevent eventual sagging. When the frames are finished, simply nail the OSB sections on top of each to make five shelves. Now for the assembly. Getting the first shelf mounted to the supports is kind of a pain – I ended up laying two supports on the ground and attaching the shelf, then flipping and attaching to the other supports. I used a couple screws at each attachment point for a little redundancy, and I may put a nail into each side as well, since nails are less prone to shearing (just in case I end up with a lot of weight on the shelves). Mounting the rest of the shelves is slightly easier than the first, but more so if you have a helper. I didn’t, so I ended up putting a couple small nails in (not too deep) to hold up one side of each shelf while I screwed in the other side. Take the nails out when you have everything up. 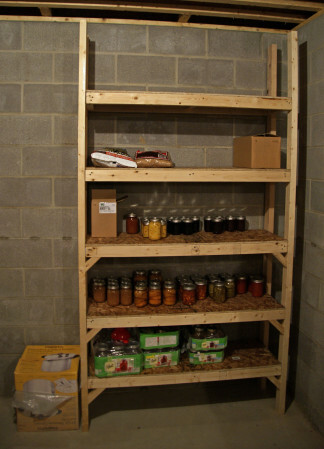 Each shelf’s bottom is about 14″ above the shelf below. Finally, I added some diagonal supports (2 x 2 pieces cut at 45 degrees). These things should be able to hold tons now. Literally. I’d also like to attach the tops to the floor framing so it’s not a stand-alone structure. I’d hate for the thing to become top-heavy and topple over. As it is right now, the tops are about 6″ too short, so I’ll need to rig up some kind of extension in order to get them secured. Other than that, they’re fully functional, and I can finally put all my canned goodness somewhere. All of the canning is impressive! I like the shelves too!